I'm hoping to next year do the envelope system so that we can have household, personal, baby, or whatever non-grocery items we need to purchase that week not take away from our grocery money. Right now our money is already designated to go elsewhere. We ended up spending a total of $10.46 at Walmart, off to Wegmans. The list for Wegmans was a little longer. We had one chicken breast left from the last family pack so we needed to stock the freezer back up. As you can see in the picture, there are 10 chicken breasts so that makes the cost to be $1.53 per chicken breast. Even though we still had some hamburger meat in the freezer, hamburgers taste so much better when the meat is fresh that's why we ended up buying a pound. I just really needed to buy one apple for Michael's school, but I couldn't resist getting myself some. I couldn't help myself, nothing says Fall/Autumn better than a nice glass of apple cider. Since I always have the calculator out on my phone I knew that I should be able to afford it. The total spent at Wegmans was $41.55. The weekly budget this week was $51.71 because we had a carry over of $1.71 from last week. The grand total spent was $52.01, making us over budget by $0.30. Yeah, didn't really think about the tax when I put that apple cider in the cart. I ended up pulling out the difference from the change that I have rolling around in my purse. When I got home, I scanned the Walmart receipt into their savings catcher app and earned $0.25 for the gallon milk purchase through Ibotta. 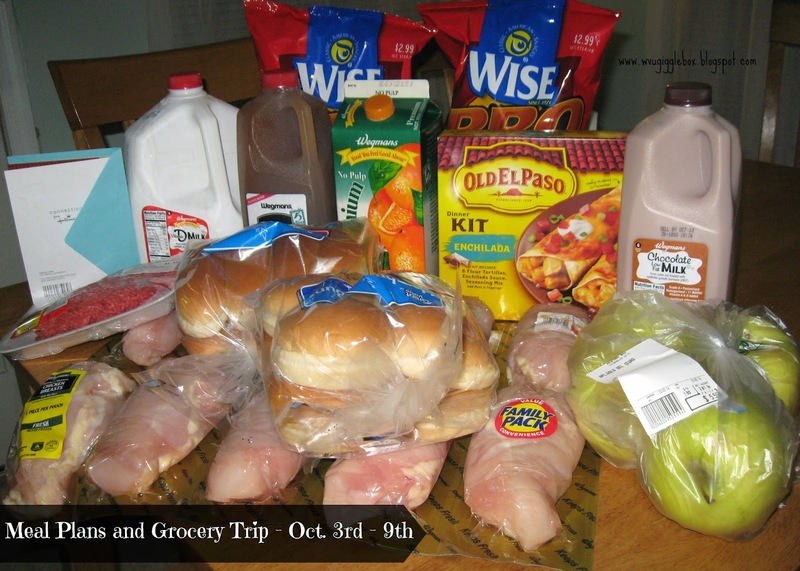 How are you doing with your grocery budget?